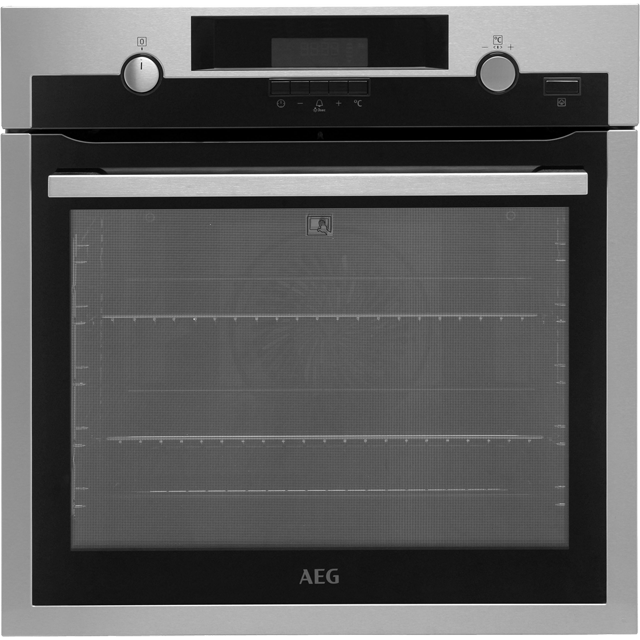 Cook like a professional with this built-in electric oven from AEG. 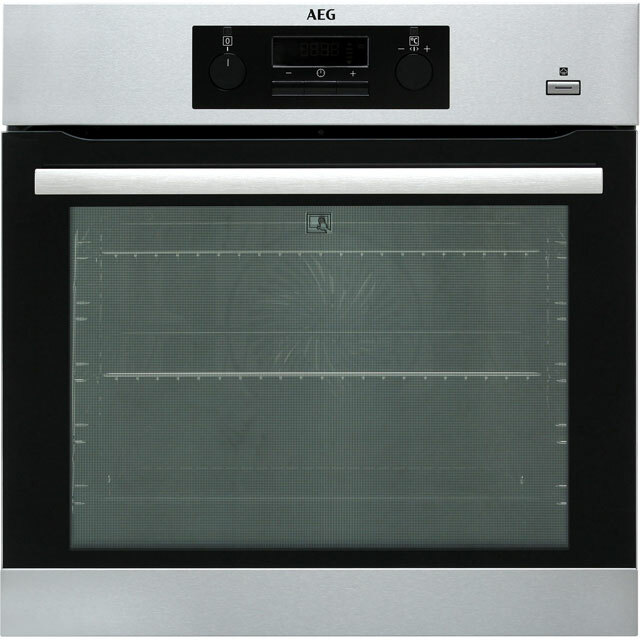 This multifunctional model gives you a range of cooking functions to choose from, so whether you’re preparing a delicious Sunday dinner or tasty homemade cookies, your creations will always be perfectly cooked. It has a 71 litre capacity, so it’s a great choice for large households too. If you enjoy making homemade bread, you’ll love the SteamBake option, as it gradually adds steam to make sure every loaf is crusty on the outside and soft on the inside. It’s totally effortless to clean too, as the pyrolytic self-cleaning function burns grease to ash inside, so all it needs is a quick wipe. This is a standard sized oven that has been designed to fit at eye level or under a worktop. 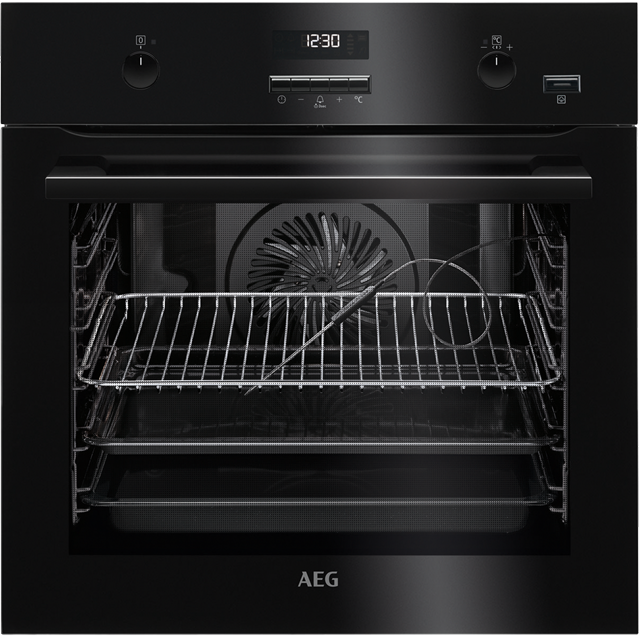 Thanks to AEG’s Pyrolytic function, cleaning your oven is easier than ever. When you’ve finished making the dinner, just select the cleaning option from the menu. It’ll secure the door and turn the temperature up to 500°C, so any grease will burn and turn into ash. Then, because all it’ll need is a quick wipe down, you’ll spend less time scrubbing and more doing the things you love. 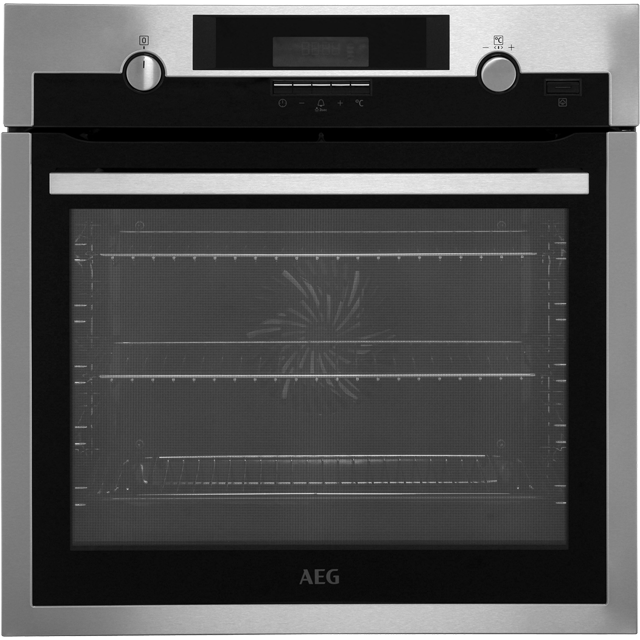 Enjoy irresistibly crusty loaves and fluffy cupcakes thanks to AEG’s SteamBake™ function. All you have to do is add water into the bottom of the oven, and select the programme. This will turn it into steam and create a humid environment inside the cavity. Because the steam locks moisture into your food and encourages dough to rise, breads and cakes are full of flavour and utterly delicious every time. AEG’s SurroundCook creates evenly cooked dishes, always. By circulating hot air around the cavity, heat hits your food equally from all angles. So, if you’ve prepared a tasty homemade lasagne, it’s guaranteed to leave the oven perfectly cooked, satisfyingly crispy, and nothing but delicious through and through. 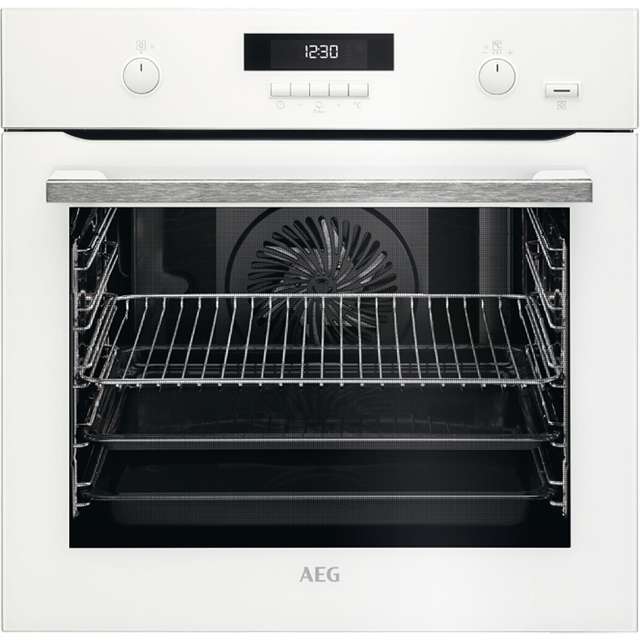 AEG’s multifunctional ovens provide plenty of different ways to cook, equipping you with the tools you’ll need to cater for any occasion. Whatever you’re in the mood for, there’ll be a programme to suit your chosen dish. So, whether you’re roasting a chicken, grilling a tasty salmon fillet, or baking a batch of fluffy muffins, you’re always guaranteed to get the most delicious results. The handy timer display lets you easily keep tabs on your dishes. The clear screen will not only show you how long your meal has left to cook, but it’ll alert you when it’s time to serve up too. This means you’ll never overcook your food, and you’re promised perfect results every time. Oven works well - the roasting tray is particularly helpful as it fits the oven exactly, and therefore makes the most of the space. Installed out of the box but could not get past first base as could not set clock. They had taken my old oven away as well so now had no means to cook. After much time on phone and no help from AO a subcontract firm from AEG came out 6 days later. The engineer fixed clock and tested it but when he left and I tried to use it the buttons worked intermittently. Now back again phoning AO and AEG etc. One of the best ovens which I ever had! Firstly simple to use, I do love fancy buttons too. I have cooked few dinners already and have to admit everything was cooked nicely, no burns or raw meat in my meals. Moreover, it looks very posh and it blends lovely with my kitchen equipments. Good oven for the money. Particularly useful as it comes with two adjustable metal shelves. Most ovens only come with one. Baking with the steam function is excellent and simple to do. Cleaning. Same as most other ovens. Temperature. We have found that things appear to need less cooking time. Overall. Very good little oven for the price.